A full understanding of the steps the Romney-led establishment took to punish the grassroots in 2012 is necessary to understand what has happened this cycle. Conservative Review’s Steve Deace took a look at how the 2012 rules, the ones campaigns are now operating under, were adopted. The rules were a direct result of the grassroots activism of the Liberty Movement, a small band of Ron Paul loyalists who ran for and won a significant portion of the delegates – bound by the rules to Romney – for the 2012 convention. The Bushtablishment, lead by Ben Ginsberg, worked to have many of these Liberty Delegates deemed unqualified to be delegates, mainly due to the rule fight. The rules, adopted at the 2012 convention, were what Ginsberg and Reince Priebus – who was the Party Chair at the time – wanted for gaining more control of the debates. Rule 10(h), as adopted, governs the debate process. (h) There shall be a Standing Committee on Presidential Primary Debates, which shall be composed of thirteen (13) members of the Republican National Committee, five (5) of whom shall be appointed by the Chairman of the Republican National Committee, and each of the four (4) regions shall elect two (2) members, one man and one woman, at its regional caucus at the RNC Summer Meeting in each even-numbered year in which no Presidential election is held. The chairman of the Republican National Committee shall appoint the chairman of the Standing Committee on Presidential Primary Debates from among the members thereof. The Standing Committee on Presidential Primary Debates shall have the authority to sanction debates on behalf of the Republican National Committee based on input from presidential campaigns and criteria which may include but are not limited to considerations of timing, frequency, format, media outlet, and the best interests of the Republican Party. Each debate sanctioned by the Standing Committee on Presidential Primary Debates shall be known as a “Sanctioned Debate.” Any presidential candidate who participates in any debate that is not a Sanctioned Debate shall not be eligible to participate in any further Sanctioned Debates. The stage was set for Preibus to put in place the debate process he wanted. As many media outlets have reported, the purpose of the RNC taking control of the debates was to avoid debate saturation, and give the RNC more control over the process. The penalty was harsh. If a campaign goes rogue, the candidate loses access to all future “sanctioned debates.” The stage was set for Preibus to put in place the debate process he wanted. The Republican National Committee (RNC) voted unanimously Friday to pull the group’s partnership with NBC and CNN for the 2016 GOP presidential primary debates unless the networks kill their planned films on Hillary Clinton. There was no larger “media game” than the most recent CNBC debate. If Priebus aimed to squelch liberal bias, his pick to chair the Standing Committee on Debates is a real head-scratcher. 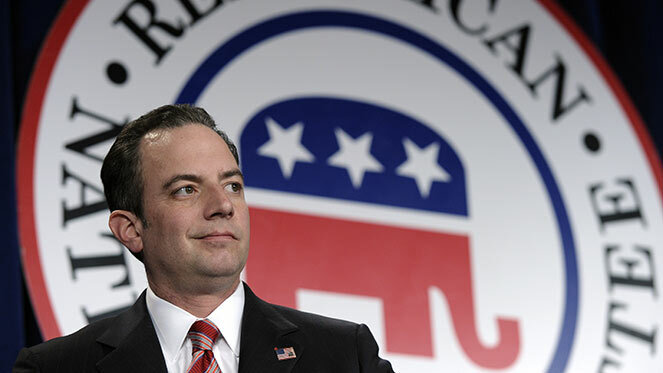 At the 2014 Summer Meeting of the Republican National Committee the members of the committee were elected by the four RNC regions and appointed by Chairman Priebus. The minutes of that meeting record who made up the committee. Chairman Priebus announced the newly elected and appointed members of the Standing Committee on Presidential Primary Debates: Peggy Lambert (NCW Tennessee), Randy Evans NCM Georgia), Henry Barbour (NCM Mississippi), Mary Buestrin (NCW Wisconsin), Bob Bennett (NCM Ohio), Helen Van Etten (NCW Kansas), Solomon Yue (NCM Oregon), Jeff Kent (NCM Washington), Susan Hutchison (SC Washington), Juliana Bergeron (NCW New Hampshire), Ron Kaufman (NCM Massachusetts), Rob Gleason (SC Pennsylvania), and Committee Chairman Steve Duprey (NCM New Hampshire). Priebus chose the Republican National Committeeman from New Hampshire, Steve Duprey, to chair the debate committee. To say that Duprey is not a conservative would be generous. Based on his affiliations, he is a full bore progressive. Duprey is a donor to Planned Parenthood Action – note: not Planned Parenthood, but their political arm. One of New Hampshire’s most prominent Republican activists and the state’s current national committeeman, Duprey apologized yesterday for showing up – however briefly or accidentally – at a local Planned Parenthood fundraiser last week. The Globe article had referenced Duprey as an example of a pro-abortion rights Republican and reported that he had recently “attended a Planned Parenthood fundraiser with the group’s national president.” That passing reference triggered criticism on social media and other local websites, including Granite Grok and Leaven For The Loaf, which focuses on anti-abortion issues. Several members of the group said education never used to be a political issue, but it has become one today. “To the extent possible, we ought to avoid politicizing it (education) and instead make sure to maximize support for a great public education for all our kids,” said Concord developer and current Republican National Committeeman Steve Duprey. Preibus chose for the debate committee, a pro-choice, pro-Common Core establishment Republican that donated to a group opposing Kelly Ayotte (F Liberty Score®) – for not being liberal enough. This is the person that Priebus put in charge of approving a debate structure, that was supposed to counter the influence of biased liberal media. Preibus chose for the debate committee, a pro-choice, pro-Common Core establishment Republican that donated to a group opposing Kelly Ayotte (F Liberty Score®) – for not being liberal enough. Duprey was not the only person on the committee who was problematic. Also on the committee is Ron Kaufman, a longtime Bushtablishment loyalist from Massachusetts. Kaufman was instrumental, as a member of the Romney campaign team, in working with Ginsberg to strip the grassroots of delegates to the National Committee. He engineered a tortuous process that required Massachusetts delegates to sign an affidavit, swearing under penalty of perjury to a Notary Public, that they would vote for Mitt Romney at the Convention. Kaufman is no friend of the grassroots. A former member of the Republican National Committee – who still regularly attends meetings – told Conservative Review that the remaining members were a mix of conservatives and moderates, but just about all were loyal to Chairman Priebus. This brings us to January of 2015, and the Winter RNC Meeting held in San Diego, California. At that meeting the standing committee on debates announced the debate schedule they had negotiated with media outlets. The same former member of the RNC told CR that grassroots conservatives were shocked that the schedule was not put up for a vote of the full Republican National Committee. It was just presented as is, and included – despite that 2013 vote – CNN and NBC News properties. A current member of the RNC, who spoke to CR on the condition of anonymity, said that the entire process was conducted without the input of the full 168 member RNC. The committee seemingly was just an approval arm for what Priebus, and Sean Spicer, a top level RNC staffer, wanted to have happen. They wanted total control, and they got it. All was seemingly going well for team RNC – until Colorado. In the week leading up to the CNBC debate, conservatives warned the RNC that the debate moderators would be a problem. Most notably, Mollie Hemingway of The Federalist who made the case – pre-debate- that “John Harwood has no business moderating” a Republican debate. A case that CR Editor in Chief Mark Levin echoed. The ensuing firestorm from the CNBC debate justified the concerns of many about the RNC’s internal debate process and how Preibus and his team engineered it. Priebus immediately went into damage control mode after the debate. He said that CNBC “should be ashamed” of the way the debate was being conducted. He didn’t take any responsibility for the debacle himself. Then the Republican campaigns decided to get together last weekend to discuss sidestepping the RNC completely for future debates. As a pre-emptive olive leaf towards the campaigns, Priebus last week suspended – not fired – NBC News from hosting a debate early next year. The campaigns still met, and according to the Boston Globe have agreed on a series of demands of the RNC and its media allies before participating in future debates. The meeting took place in a ballroom signed “family meeting,” which would make Michael Corleone proud of the power play. Politico has reported that the campaigns are working with Ben Ginsberg – the man who helped author the rules by which the RNC controls the debates – to negotiate with the RNC and media outlets on the rules of future debates. Ginsberg has circulated a draft letter which outlines areas campaigns want addressed before agreeing to any future debate after the November 10th Fox Business debate. Priebus has elevated Sean Cairncross, the chief operating officer of the RNC and its former chief counsel, to be the GOP’s new lead debate negotiator and organizer. The move effectively gives the debate responsibilities currently held by Sean Spicer, the RNC’s chief strategist and spokesman, to Cairncross. Spicer, a confidant of Priebus, will remain in his role but will work in a supplementary position when it comes to arranging the debates. Bowing to the concerns of the campaign, Priebus took decision making authority away from the person he made responsible for the debate process. When Priebus tries to deflect blame for the debate process, it is helpful to remember that he engineered the current process and ultimately wanted more control. Given the results of recent debates, most particularly CNBC, the road to the CNBC disaster stops at Preibus. ← Last Chance to Join the Town Committee Slate!